I am so excited about the new Jane Campion film Bright Star I just can't contain myself and here I am waxing on about it to all of you! If you have time visit here and click on each of the little scraps and photos to gain an insight into Jane's creative process with her and some of the team that worked on the film.................., lovely! I am crazy about beautiful period costume and set design and from the snippets I have seen they are sublime, locations look wonderful too! The film is based on the relationship between John Keats and Fanny Brawne. The letters that Keats wrote to Fanny were a source and of course his poem, Bright Star. Fanny kept his letters all her life, thank goodness! post script: There was a lovely article in Telegraph Magazine you might want to check out. For Silver Pebble! Bright Star is released on November 6th. 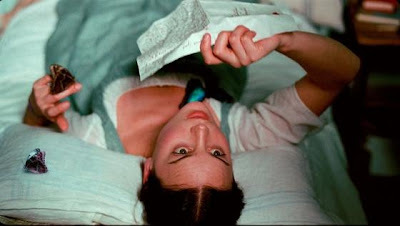 "So bright and delicate:Love letters and poems of John Keats to Fanny Brawne"
Bright Star is filled with such an enormity of love and feeling, it nearly takes your breath away. The film's rapturous images and Campion's vision make you long for a world as vivid and true as this one. You have made my Saturday. I watched the trailer with bubbling excitement. I am a huge Piano fan too. What a fabulous thing to look forward to - do you know when it's released? The costumes and setting look amazing - thanks for the tip off. The photo's from the film look amazing. And the film sounds right up my street too. Shall have to keep an eye out for that one. I can't wait to see this film, it looks brilliant. I adore movies like this, so much to feast your eyes on with all the costumes etc. I'm getting all excited thinking about it. Being a pianist myself, I too, loved The Piano. I can't wait to see this film! Also, thanks for the nice comment on my blog. You made my day! did you notice Fanny's wearing a Sophie Digard cardi? I'll have to look for this film. It sounds very good. I have to say that it does sound rather good! I saw a clip at the weekend. Not just a scarf BUT A CARDI !!!!!! oH HEAVEN on earth! Thank you for your kind comment my Liberty Lawn Lovely! Send me your address and I will pop a couple of xmas cards in the post to you. ps Write up in Sunday Times about this gorgeous film. Haven't had chance to read it yet, but the write up seems very favourable....so thank you I'm looking forward v much to seeing it myself now. oh I agree this does look amazing! I love these type of films with so much eye candy..the costumes always amaze me! I really would love to dress in some of those lovely clothes! Thanks for sharing I will watch for it! I heard an interview with JC on Radio 4 the other day and made a mental note of looking out for the film when it's released and after seeing all these bea-u-ti-ful costumes it's going to be a must!